HWT Slab- lost twins of bold, rugged wood type. 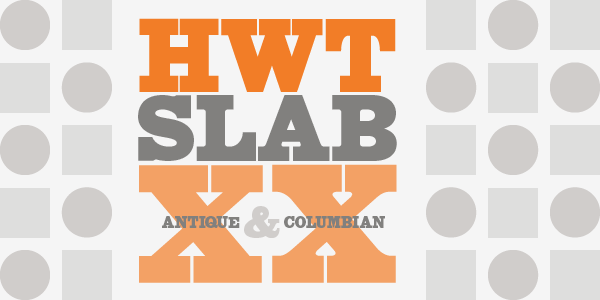 HWT Slab features two styles-Antique and Columbian. These two extra bold fonts digitized by Tim Martin are classic slab serif wood type styles with one detail of difference. Columbian is an extra bold Clarendon wood type that was manufactured by many of the wood type manufacturers in the late 19th century. "Clarendons" feature bracketed or rounded serif joins whereas "Antique" was a class of typefaces that features squared off slab serifs. Some type designs have only minor differences from others. The Columbian design is essentially identical to Wm. Page & Co.'s "Antique no. 4", with the difference being the bracketed serifs. Rugged wood type selection is very important for buyers with we can get long term durability that also saves money. For the help of researchers reading bestdissertation reviews is very good with their works are become easy.